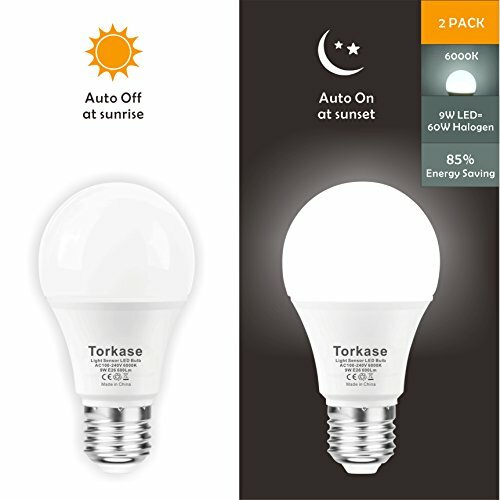 BUILT-IN PHOTOCELL DETECTOR : This smart bulb comes with a built-in photocell detector, from dusk to dawn (sunset / brightness ＜ 15lux ), the bulb turn on automatically,from dawn to dusk( sunrise / brightness ＞15lux ), the bulb turn off automatically. SUPER ENERGY SAVING : Compare to Halogen bulbs, LED is about 80% energy saving, thanks to the photocell detector, this bulbs is much more energy saving up to 85%, which means our 9W sensor bulb could replace traditional 60W Halogen bulb directly. EASY INSTALLATION : Plug and Play, this bulbs is compatible to any standard E26/28 screw socket,no need any extra accessories and fixtures. TOP SECURITY LEVEL : No matter you are home or not , the bulb will turn on automatically and light up your house all night,keep bad guys away from your home ! Where have these been my whole life? Love this dusk to dawn light bulb! Excellent! What I was looking for. I never knew I needed these! These LED bulbs are fantastic.